Ranma Saotome is the sole living heir to the Saotome school of martial arts. Upon his death, her father gave her the family sword and the family obligation; in the years since, her life has been dedicated to her promise to her father. It is a promise she does not understand nor know how to keep, a responsibility whose weight she could not hope to comprehend when it was placed upon her shoulders. Her father gave her more than a sword and a quest; she knows at least that much. There is a dark strength deep within her that was given to her the day her father died. It grows every day, driving her onwards to seek out the next challenge, the next opportunity to learn and improve her skill. She has no ties, no friends, no family. Nothing but the promise. A promise to keep the Saotome family line strong. Living the life of a nomad, she wanders from town to town; seeking answers to questions she does not know how to ask, wielding a power she cannot fully understand, seeking a girl who may or may not still be alive. The girl's name is Akane Tendo, and she is in danger. Ranma has sworn upon her father's life to protect her and will go to any length to keep her safe. Those who would stand in Ranma's way also grow stronger with every passing day, but have always lagged behind her on her journey to the peak of perfection. That journey is drawing to a close. Perhaps, Ranma will understand the price of perfection before that journey is over. A collection of art based upon the story. You will find these images scattered through the chapters as you read the story, but if you would like to see them all in one place, this is the place to check. Caution: This page contains spoilers for the story. Akane and Ranma leave the Tendo home and make their way out of the city. Ranma seems keen to press on, but Akane is curious about her new travelling companion. Ranma tells Akane a little more about herself and her father. 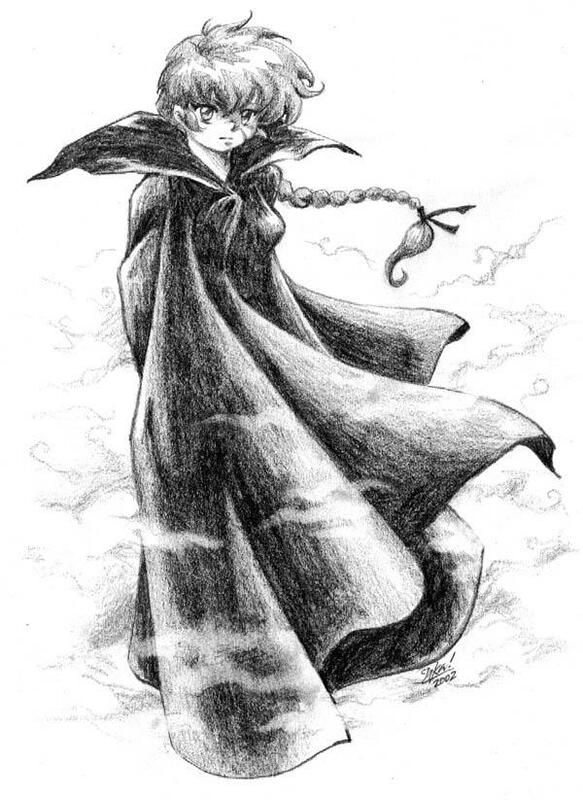 Akane follows Ranma further from her home, into a forboding, darkened forest. Ranma too journeys into the wilderness; the darkened recesses of her own memories. A figure from Ranma's past arrives, with painful memories of her own, and a desire to exact revenge. Ranma's attempts to hide Akane from the hunters seem to have been in vain as one of their number makes a sudden appearance. Akane takes flight as her suspiscions seem to be confirmed. Ranma and Shampoo arrive in Japan and set out in search of Kayoko. Ranma, the hunters and Hidari at her heels, takes Akane to an old student of hers, one who shares a special understanding of both herself and Akane. The time has come for Akane to awaken to what she truly is, what she is capable of, and why Ranma will never leave her side. She has taken many steps from home, now, it is time to take her first step into the wonderful. The master and the student shall learn together - but which is the master and which is the student? Ranma and Akane emerge from hiding. Six months with no sign of the hunters has left them curious, and they set off to find out more about those who seek to harm Akane. Left with no alternative, Ranma and Akane have no choice but to fight the Hidari. Meanwhile, Ukyo finds herself having difficulty adjusting to her new home. Ranma, Shampoo and Ukyo finally arrive at their destination: the small fishing village Edo, which will one day become Tokyo. Ranma and Shampoo immediately set out for Kayoko's house to find the girl that Ranma has been seeking; meanwhile, Ukyo takes her leave and sets about a task of her own. Ranma, Kayoko and the wounded Shampoo escape from Edo and make their way west toward Okinawa. Kayoko tells Ranma more about herself, and Ranma makes a decision that will change her life forever. Ukyo awakens once more, the surgical modifications to her body complete. She asks Ryoga to find her sword, Seriatim, which was lost when she was brought aboard the Leviathan Spring. He does so, but makes a discovery of his own. Ranma and Akane - having traveled the plains and mountains of Hokkaido - arrive at Mt. Moiwa, just southwest of Sapporo. Ranma assures Akane that Happosai's home in the Shiroishi Ward of the city will be a safe haven for them to study the lab results they obtained in Osaka. However, Akane can't quite shake the feeling that they are being watched. Ukyo wakes to find Ranma's sword at her neck. Ranma demands to know where Akane has been taken; Ukyo has no choice but to answer her questions. Meanwhile, Akane finds herself lying in bed in a darkened room, but she is not alone. Ranma arrives aboard the Leviathan Spring, where Akane is waiting. Ukyo realises only too late that bringing them together was not such a good idea. Ukyo is reunited with Ryoga and Yoiko, although under less than friendly circumstances. Meanwhile, Akane realises she is at last about to be reunited with Ranma. As of March 2004, Ten is still very much a work in progress. Your comments are very welcome, let me know what you think! Pencil artwork by the very talented Irka.